The only product to allow you to go through the Official DVSA data bank of 929 ADI Theory Test multiple choice practice questions in one of three different ways to best suit your needs. Course Module sequence - in this practice programme the Official DVSA questions are arranged in such a way as to help assess your knowledge and understanding as your progress through our structured ADI training course. The modules of study go beyond what is necessary to pass the ADI Theory Test. They also provide a sound foundation upon which to build your driving and teaching skills in preparation for the driving and the instructing parts of the ADI examination. You can choose to ignore the study element at this stage and simply concentrate on passing the part 1 ADI Theory Test by simply learning the answers to each of the Official DVSA questions using this practice programme or indeed one of the other two practice programmes below. You can then return to the study as you prepare for parts 2 and 3 of the ADI examination. Course Publication sequence - in this practice programme the Official DVSA questions are arranged and grouped by the various course publications necessary to help you become a driving instructor. The starting publication being the Highway Code followed by LDC's Highway Code supplementary notes, various LDC course materials, the LDC Driving Skills Workbook, the DVSA book Driving the essential skills and the Official Driving Test. Key Question sequence - in this practice programme only the key Official DVSA questions are included (i.e. those questions that we believe relate to the knowledge likely to be tested in the ADI Theory Test) grouped into the various ADI Theory Test Bands or groups. These bands are used to create a balanced test and to determine whether you have obtained a sufficient score within each of the four bands to pass (i.e. minimum of 20 within each) as well as scoring 85 or more overall. These are the questions we believe are critical to success. 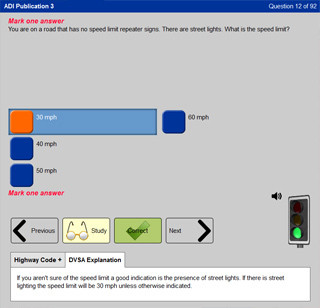 6 multiple choice Theory Tests using Official DVSA practice questions, answers and explanations. The 6 tests have also been specially configured so that they can be used as a learning programme - for those in a real hurry who want to undertake the minimum amount of preparation but still ensure test success. These 6 tests cover the key practice questions designed to cover every aspect of the theory that you need to know and understand. Therefore if you don't have time to complete the practice and study you can simply undertake these 6 tests. 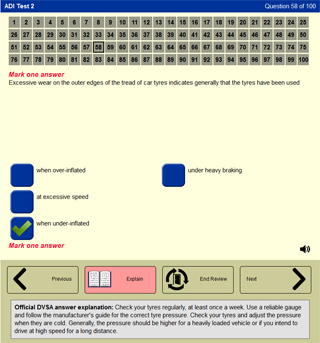 Unlimited randomly generated properly balanced multiple choice tests using Official DVSA practice questions, answers and explanations to give you the added comfort of knowing you are more than ready. Basically ensuring nothing is left to chance. 2 Hazard Perception Tests incorporating 26 DVSA hazard perception practice clips. The first test uses the original real life format DVSA practice hazard clips (currently used) and the second test also includes ten computer generated (CGI) hazard clips to help you get ready for the hazard perception tests of the future. The CGI clips are designed to look as close to real life as possible so don't be surprised if you can not spot the difference. In every other aspect the new test will be the same as the current test. Indeed, the CGI clips when introduced will simply be computer generated versions of the current real life clips used on the test. Ten highly realistic additional Hazard Perception Test simulations to help you fully prepare for the hazard perception part of the Theory Test provided by instructor training experts LDC. Each test contains 14 hazard clips to try out and review your score giving you an extra 140 hazard clips to practice with (i.e. 168 in total). No other online product offers you so many hazard clips of this quality. 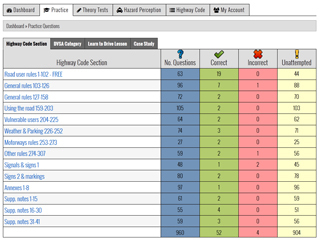 Learn the Highway Code as you prepare for your Theory Test. Contains all the latest information.